Grill It, smash it, blend It, drink It. 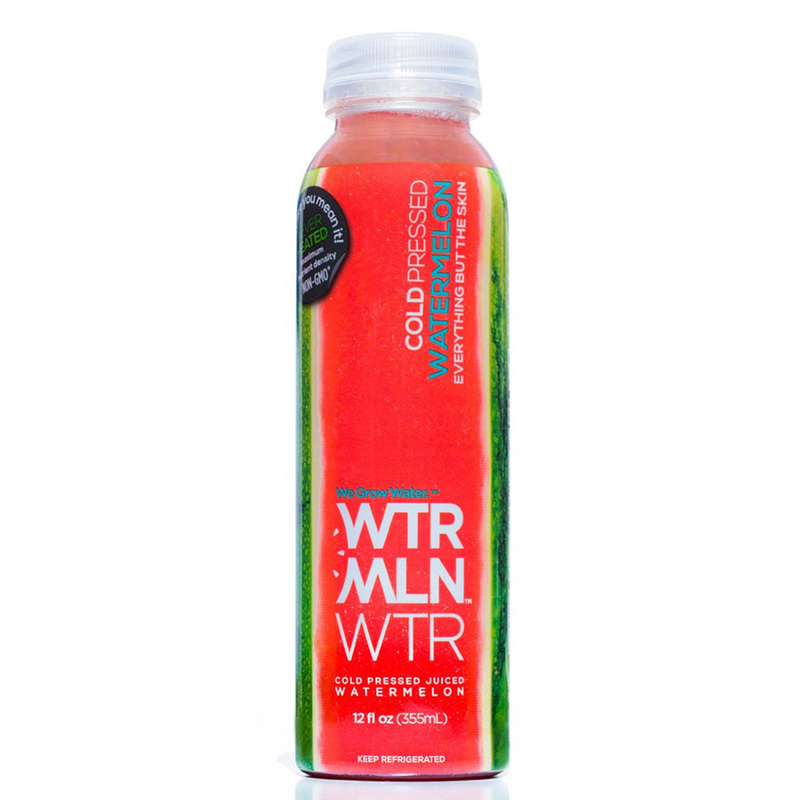 TRY SOMETHING NEW WITH WATERMELON TODAY. Happy National Watermelon Day! 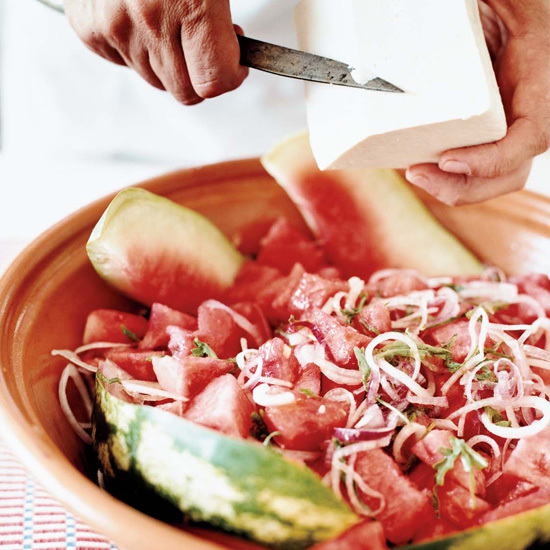 Celebrate our favorite summer fruit by trying something new today—grill it like a steak, blend it into gazpacho, or make it the star of a refreshing Thai Salad. 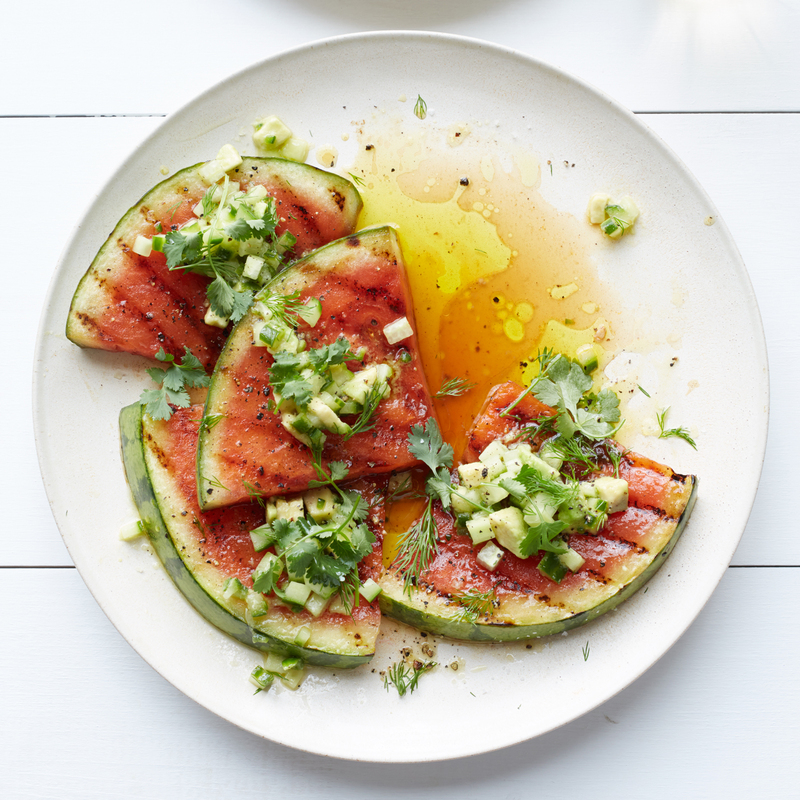 Charring watermelon on the grill quickly caramelizes the sugars and adds a light toasty flavor to the super crisp and juicy fruit. If you serve it hot off the grill, you get a nice contrast of temperatures in every bite. 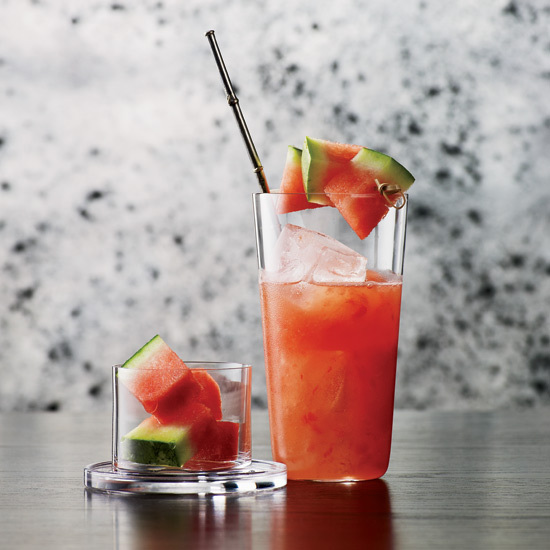 This super refreshing take on a caipirinha starts with muddled watermelon and is lightly sweetened with agave. St. Germain gives the drink a light floral note. You could have fun with the garnish here, with whimsical picks and watermelon balls of different sizes. This stunning salad for a crowd from star chef Tom Colicchio is one of the simplest and best salads we've ever featured. 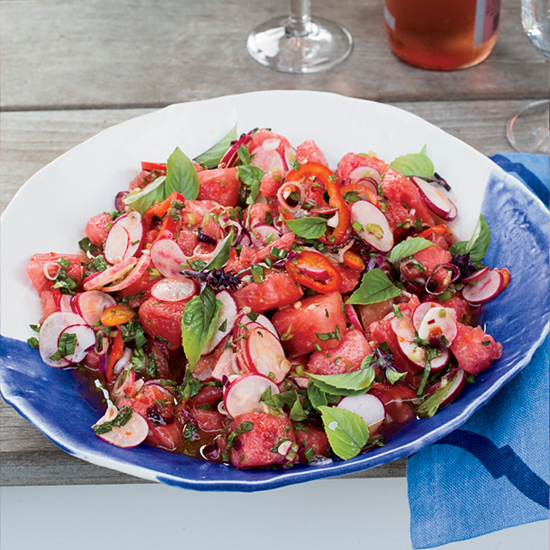 It's mostly just sweet, crisp, juicy watermelon cubes, sliced radishes and lots and lots of mint and Thai basil with a bit hit of lime juice and a kick from hot red chiles. In Sardinia, bitter greens like arugula grow in gardens alongside watermelons, so the two are frequently served together. Here they're embellished with red onions, walnuts and shavings of ricotta salata cheese. If you have a bottle of raspberry vinegar somewhere in the back of your cupboard, bring it out for this salad. If not, a nice red wine vinegar would be good too. 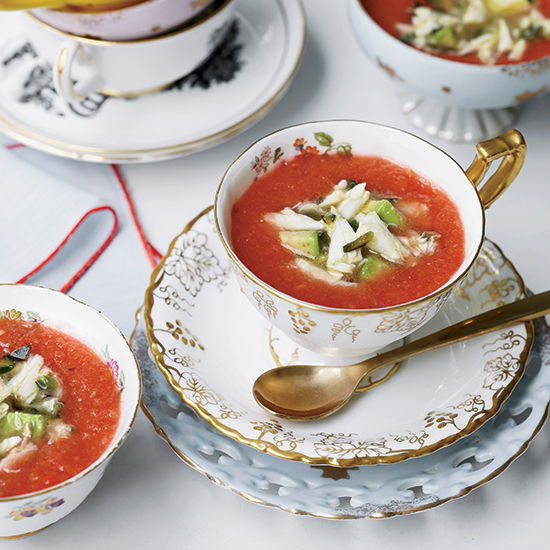 This is a dinner party-worthy gazpacho since it has a fancy crab, avocado and poblano garnish, but the soup itself has a nice bit of heat that balances the sweet , fruity flavors of the tomatoes and the watermelon. 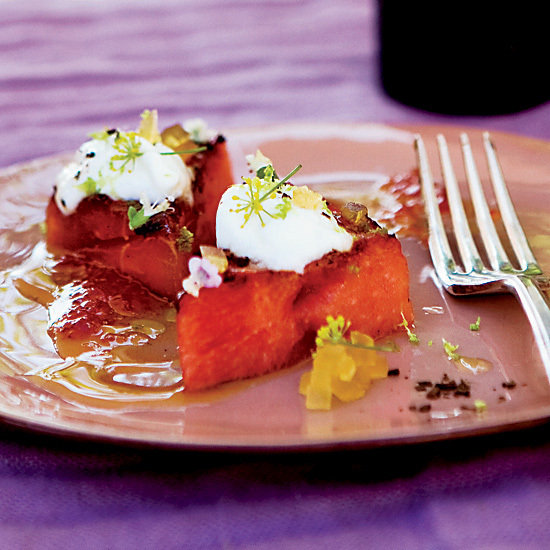 For a modern take on a traditional Greek watermelon and feta salad, try these little grilled steaks topped with tangy yogurt seasoned with fresh thyme. And if you don't feel like eating or drinking, at least have some fun at watermelon.org.